Copyright 2010, 2012 Adobe Systems Incorporated (http://www.adobe.com/), with Reserved Font Name ‘Source’. All Rights Reserved. Source is a trademark of Adobe Systems Incorporated in the United States and/or other countries. 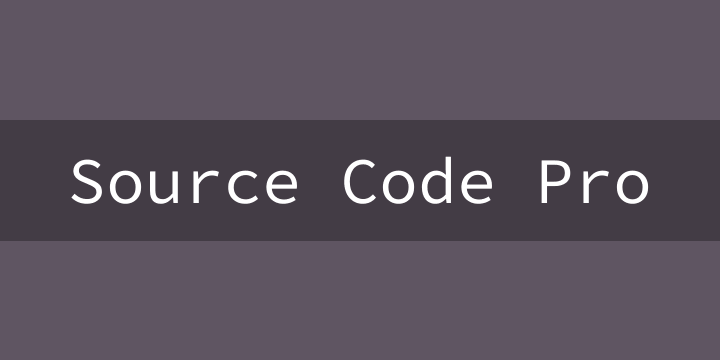 Source Code was designed by Paul D. Hunt as a companion to Source Sans. This complementary family was adapted from the Source design due to a request to create a monospaced version for coding applications. Source Code preserves the design features and vertical proportions of Source Sans, but alters the glyph widths so that they are uniform across all glyphs and weights. Although this family was designed specifically for coding environments, for which a regular weight will typically suffice, Source Code has been made available in the same weight range as the corresponding Source Sans design. Source Code Pro currently supports a wide range of languages using the Latin script, and includes all the characters in the Adobe Latin 4 glyph set.